There is barely another instrument to combine both zeitgeist and timelessness in the way a spinet does: Despite being around for centuries already, its sound is still relevant in many musical territories, while at the same time being inextricably connected to the musical works of its time. The brilliant timbre comprises lots of majestic warmth and elegance as well - something often underestimated due to cold and sterile sounding spinet simulations of current keyboards and samplers. The English Spinet library features an instrument built by Thomas Hitchcock in London in 1718. Hitchcocks instruments are widely known as the best-sounding spinets ever built and pointed the way ahead for all spinets to come. Only about 36 of his masterpieces are preserved to this day. This unique instrument in the collection of Andreas Beurmann still remains in excellent condition and is fully playable despite its age. 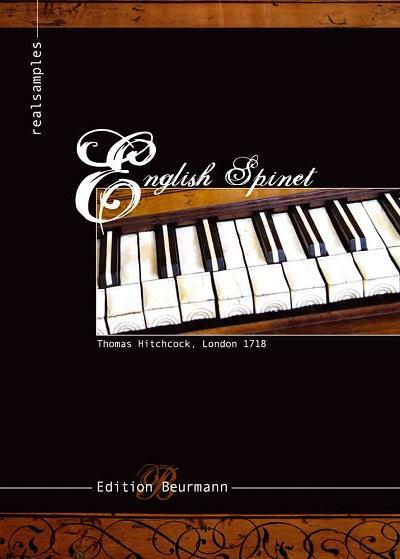 It is now available for the first time for your sampler within the English Spinet library, presented in its original Valotti tuning at 403 Hz. Until now, many keyboards and samplers represented spinets by always triggering off the exact same digital sample, leaving said sterile sounding impression. In order to improve upon previous recreations and to pay tribute to the liveliness and depth of this historical instrument, we captured 8 variations of each note. The release sounds of the keys are also of major importance: What was originally side noise is now often overlooked and even simply left out in artifical simulations, resulting in a very abstract overall picture. Therefore, we recorded 4 release samples of each note. To start right away, presets are available for all common sample formats including HAlion, Kontakt2, EXS24 or GigaStudio3. The sample library consists of more than 700 single samples. For the critical task of recording this spinet, we employed active tube-driven Royer R-122V ribbon microphones in conjunction with Crane Song Flamingo preamps and Universal Audio 2192 digital converters to do the instrument justice. For maximum sound quality, we recorded in 192 khz/24 bits, downsampled. In addition to the samples, the library contains an essay in German from Professor Andreas E. Beurmann himself, explaining both the historical and musical background of the instrument.